China Antiager BLE Suppliers, China Antiager BLE Manufacturers. 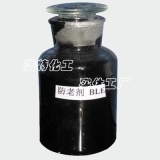 Antioxidant BLE is light gray solid, non-toxic, soluble in acetone, benzene and other organic solvents, insoluble in water. In natural rubber and neoprene, nitrile, butylbenzene, butadiene and other synthetic rubber and latex can be used as general-purpose antioxidant. On the heat, oxygen, ozone, climate and flexion have a good protective performance. In the rubber material easier to disperse, for tires, tape, hose and other industrial products production.